Jimmy Carter (formally James Earl Carter, Jr.) born October 1, 1924, in Plains, Georgia, was 39th President of the United States from 1977 to 1981. 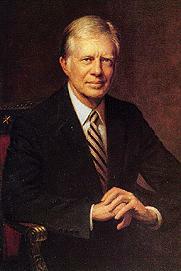 Carter, a Democrat who was former governor of Georgia, was elected as an outsider to Washington, defeating incumbent Gerald Ford in 1976. His term was marked by the 444-day humiliation of the Iran Hostage Crisis (when Iranian students held American diplomats hostage in Tehran), the successful Camp David Accords between Israel and Egypt, the end of détente with the Soviet Union after its invasion of Afghanistan, the boycott of the 1980 Moscow Olympics, and the return of the Panama Canal to Panama. With the international crises compounded by stagflation (high unemployment, high inflation and slow economic growth, together with very high interest rates and energy shortages) at home, the country was in a pessimistic mood. The voters blamed Carter for the malaise and he was defeated by conservative Republican Ronald Reagan in a landslide in 1980. After leaving the White House Carter went on numerous high profile international and humanitarian missions, winning the Nobel Peace Prize in 2002. This page was last modified 02:29, 27 May 2013.